Description: Use this powerful utility to find and extract, edit, import and export icons and manage icon libraries. ArtIcons Pro contains a variety of paint tools allowing creation and editing of icons with image formats in either standard or custom sizes in color depths up to 32-bit True Color. Icons can be imported from imager and library files and even from executables. ArtIcons allows you to arrange icons into libraries. It supports Windows Vista icons. Description: Colibrico Design Studio is a large graphics collection and design tool. 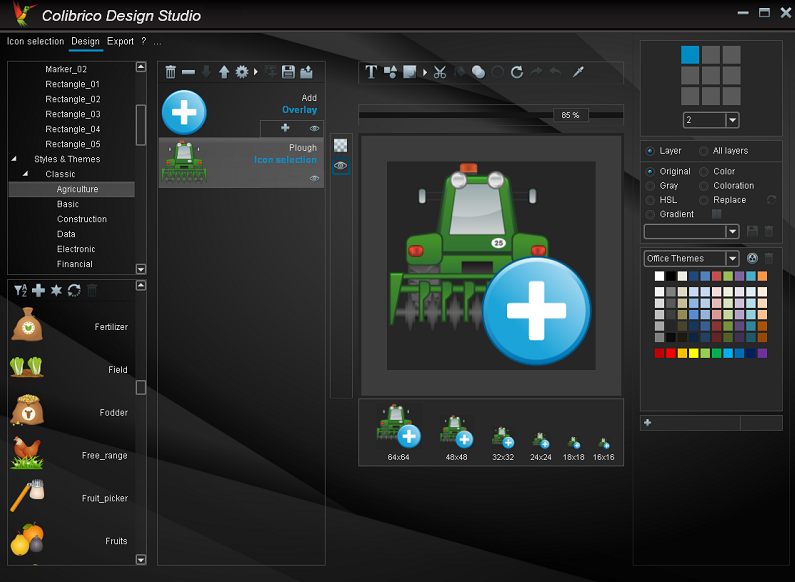 With Colibrico you automate the creation of graphics. Providing the graphics via the graphics tool offers several advantages: The graphics can be exported in any size. All graphics can be combined. The color of the graphics can be adjusted. Design elements are used to create individual button sets. Description: EXE to ICO Converter is an easy to use application that allows you to convert EXE, DLL, and OCX to ICO. This software auto scan the file that you select and allows you to export XOR, AND and Transparent Image. It is a useful utility that extract the icons in any EXE and other file types. System Requirements: Windows XP, Windows 2003 Server, Windows Vista Windows 7 and Windows 8. Description: Falco Icon Editor is a Graphics Tool to create, edit and export icons. Create professional looking icons with ease. Description: Icon Viewer Pro is a nice but small utility for viewing all the icon resources within an .exe or .dll file. Browse a directory and navigate to a file (.exe or .dll), and IconViewerPro quickly displays the icon in its program window. This program allows you to view the large icon or small icon. You can copy copy the image of a single icon into the clipboard for use in your own applications. Description: Icon Changer is a software application that makes changing icons on the desktop fun and easy. It's a hassle-free way to personalize your desktop without having to open up any computer manuals. Simply click the icon you want to change, point at the one you like and that's all. Change icons to make navigation easier, to group similar applications together, or merely to customize and spice up your desktop. Try it! Description: IconEdit2 is a TrueColor Icon Editor for Windows 9x/ME/NT4/200x/XP and Vista. It supports ICO, ICL, NIL, EXE, DLL, GIF, TIFF, BMP, JPEG and PNG files for open/extract/convert to icons. Can save your work as 48x48, 32x32 or 16x16 ICO (TrueColor, 256-color or 16 color), as well as GIF, TIFF, BMP, JPEG or PNG files. Allows you to paint, undo/redo, search for icons in your files and capture screen areas. Contains a library of sample icons. Description: Icons8 app allows to search icons and insert directly into Photoshop, Xcode or anything. Contains 49 000+ free icons for developers and designers in multiple sizes up to 512x512 px, in several styles. The application resides in status bar and allows to search by tags. SVG (except for the 'Free Popular' collection), EPS and PDF files are available for a fee.